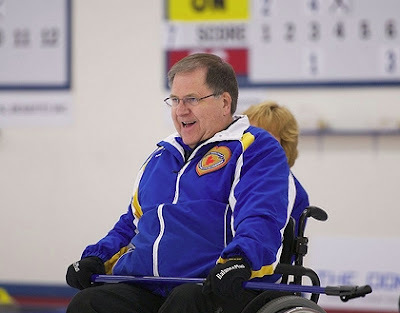 Calgary based Team Alberta, many people's favourites to win this year's Canadian National Wheelchair Championships in Edmonton, lost just one game during round robin play - 6-3 to Mike Fitzgerald's Nova Scotia rink. This afternoon saw a rematch in the Page Playoff 1 vs 2 game. Nova Scotia put lots of rocks into the house in the opening end, but missed a hit "for a bundle" as described by a relieved Andy Jones, Alberta coach, his team opening the scoring with a stolen point. In the second skip Mike Fitzgerald executes a tap to score 2, and when Alberta skip Bruno Yizek's attempted double to score two in the third, jams, Nova Scotia adds to their lead - 3-1. In the 4th, Bruno is light on his last rock draw allowing another stolen point for a 4-1 Nova Scotia lead at the break. "Nova Scotia are playing really well," admits Jones, "but our team are still confident and positive." 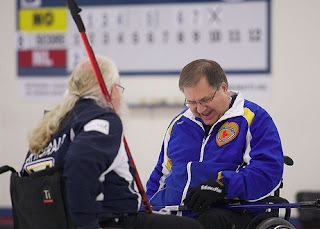 That confidence was not misplaced as Bruno executes a cold draw for a second point in the 5th, and the next end sees Mike Fitzgerald's attempted hit for 2, crash on a guard allowing Alberta a steal to tie the game at 4-4. Nova Scotia faced a house full of Alberta stones in the 7th. With Alberta lying 6 and with 4 in the 4 foot, Fitzgerald pulled out a game saving double and stick to limit the damage to a steal of 2. 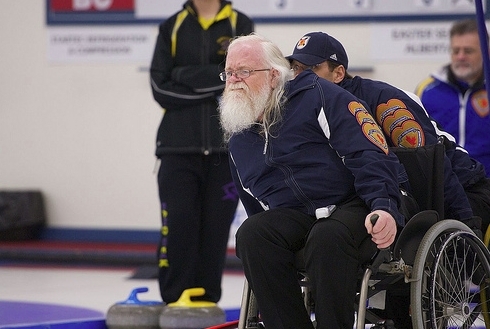 Down by two in the 8th end, and in deep time trouble, Fitzgerald is forced to hurry Nova Scotia's final stone attempt to score a second point. He flashes, leaving Alberta the winners 6-5.